John Elliott, 89, of the Santa Ynez Valley, passed away on March 17, 2019, at Cottage Hospital in Santa Barbara with family members at his side. John was born on October 9, 1929, in Brooklyn, New York. He joined the U.S. Navy at 18 and served on the USS Saipan as a baker, an assignment that shaped the course of his life. Upon discharge, he enrolled at New York City's Culinary Arts College, and his career developed steadily, beginning with an apprenticeship at the iconic 21 Club in Manhattan. Stints at Sardi's, Lüchow's, and the Hotel Edison followed. 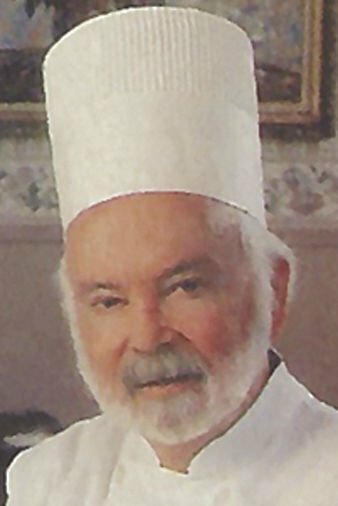 He trained under Julia Child and was executive chef at Helen Corbitt's famous Zodiac Room at Neiman Marcus in Dallas, where he met his future wife, Alice Flynn. The two were married on June 25, 1960, at Our Lady of Sorrows Church in Santa Barbara. They chose Ballard as the ideal setting to raise their two children, Barbara and Charles. After working at the Somerset Restaurant and the Santa Barbara Inn, John was ready for his own venture. He and Alice opened the Ballard Store Restaurant on May 14, 1971. For 30 years, the Ballard Store was a landmark in the restaurant—and wine—history of the Santa Ynez Valley. Serving fine Continental cuisine in the rural setting, the restaurant drew illustrious patrons. President and Mrs. Reagan were frequent guests, as was André Tchelistcheff, doyen of the California wine industry. Looking to the future, John supported the program for culinary arts at Santa Barbara City College by funding scholarships for local students. Alice Elliott died May 22, 2018. John is survived by his sister, Maureen Gibbons; daughter, Barbara Elliott; son, Charles Elliott; and three grandchildren, Chelsi, Chandler, and Chaise Elliott. John Elliott will be remembered with a Rosary at 10:30 a.m. and then a Mass at 11:00 a.m. on April 26 at Old Mission Santa Inés, where John attended daily Mass. A reception in the parish hall will follow. The private burial will take place at a later date.